John sat in his sterile office pod and listened to Wagner. It was Saturday Night and every other cubicle in the sprawling office was righteously empty and dimmed. Only his desktop lamp shone out into the gloom. He had ‘Live From the Met’ on the radio and, although the bulk of the music washed past him, it still seemed to give him a sense of his own intelligence as he listened to it. This week it was ‘Tristan and Isolde’. His favourite part was always the applause that came right at the end. On and on it thundered, like some hugely expensive release in a hugely expensive brothel. Of course he should have been at home with his family but this was the third Saturday night in a row that he had perched here, alone in his computer-buzzing office space. The documents had to arrive on the other side of the world at this particular time and automation simply could not be trusted. There was no other way acceptable to that terse little man who resided in the end-room during normal office hours. John simply had to come in and get it done. The pdf files were being generated now so there was really nothing else that he had to do. He sat back and tried to focus on the music. He tried to guess if the applause was coming any time soon. It felt like there was still quite a way to go. He shivered involuntarily and reached for his long-cold coffee. As with the other two Saturday nights he had sat here, he could not shake the feeling that he was being watched. There was nobody else in the building but still his spine was telling him that he was being scrutinised. Not just by a single person either but rather by a group, a cohort, a team. He effected another shiver to try to revive himself. There was nobody watching. Late evening, self pity, paranoia, that was all. This would hopefully be the last Saturday he would have to come in and do this. He could live without any more Wagner at The Met, even the applause. There it was again though. The feeling. Someone was watching him, he was sure of it. His attention fell on the ceiling-mounted security camera at the far end of the room. There was a small unwavering red light on top of it and it was pointed straight at him, like an eye. That was it, wasn't it? It was the security camera that was watching him. He had investigated it last week, found the cupboard where the footage from the camera was recorded onto a loop tape. Nobody ever monitored it, nobody ever looked at it, it was just a souvenir from a more buoyant time when people seemed to care about such things. It might be capturing him, recording him even, but nobody was watching it. Nobody cared. Still a small worm-thought wriggled and turned in the recesses of his mind. Something he had read once. 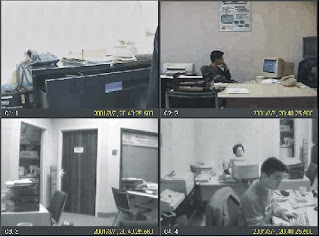 Something about security cameras being secretly accessed by people via the Internet. Weren’t the images of certain cameras being unwittingly beamed onto the web and couldn’t people log into them simply by chasing them down in Google? The pdfs were still cooking, he had some time to kill. He went onto Google and entered ‘network camera’ and hit the search button. There wasn’t much there but there was a link to a link to another link and, suddenly, he was watching an office scene via some monochrome webcam. An office not unlike his own. Except this one was vacant, the occupant doubtless out on some Saturday Night Spree or sitting at home by the fire watching some fine old movie. He looked up at his own camera. Could someone be watching him over the Internet? Over in the corner, beside the water cooler, there was a flipchart with some spare sheets of large white paper still clipped to it. There were some permanent markers too. He dragged it over to where he thought the camera might see it. What to write? After a moment, he figured it out. Open a line of communication. His email address. He wrote it clearly so that anyone could see it. He slid his chair back over to his desk and logged into his email account. There was nothing there. Nothing new. One, two, three, four, five emails clicked into his inbox. Six, seven, eight, the number steady ticking upward like a metronome. He opened the first of the emails. The second said, “Hello dear.” The third said nothing at all. All of the emails offered either some bland non-committal greeting or else pure blank silence. All from different addresses made up of random numbers and letters. On and on, the number ticked upwards. They didn't stop. The next email he clicked on gave him an answer. “We Are Legion.” It said. The next email said exactly the same thing and the next and the next and the next. Another sheet and another sweatily-scrawled query. The emails stopped. At seventy two, they stopped. It was as if the faceless correspondents had paused to consider the request. Wagner was drawing to a close, he could sense it, behind all the dread. “What do you want?” He wrote, a second time. The emails started again. Click, click, click. Seventy three, seventy four, seventy five… they all said the same thing. John sat back and stared at the screen. He would not dance. It was too wrong, it was far too wrong. Wagner’s music ended. The radio audience rose in united, colossal, thunderous applause. The five hundredth email clicked in. brilliant, loved it, thank you! Enjoyed this. It could’ve gone a few different ways. A large part of Left takes place via chat but only one side has a camera. It’s an uncomfortable position to be in. Interestingly the one who’s the most uncomfortable is the one who can see the other. I like the open-endedness of this piece of yours. It can be overdone—I have a friend who posts a lot of flash pieces and they’re always open-ended—but one or two every now and then works. I still remember the ending to ‘The Nine Billion Names of God’ and it’s been years since I read it. I just thought it was such a wonderful way to end the piece. I know a lot of people don’t like them—they feel cheated—when the writer tosses the ball (or, maybe, the grenade) into their lap and leaves them with it but it all depends on how much you’ve left your reader to do to complete the story how effective the technique it. You don’t have to do all the work. I actually think it’s bad writing to try to. 'Another lovely piece Ken. You were there, on your PC, writing this. I am watching and reading. It may not be in "real time," but there is a certain irony in that. Intriguing. I really liked it. Many thanks.